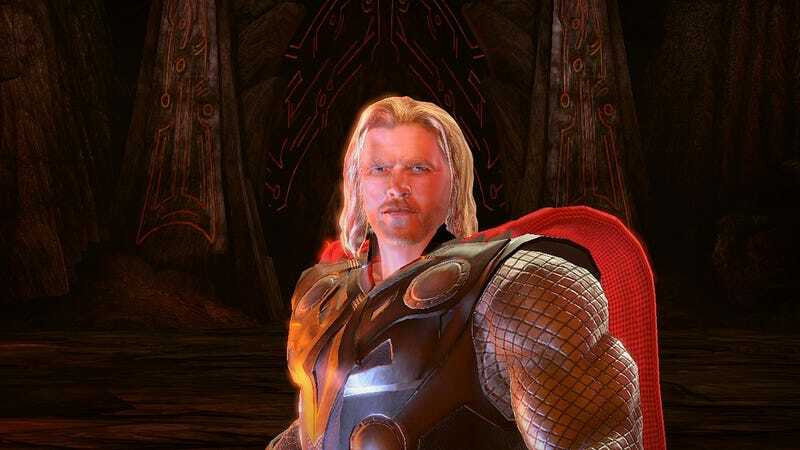 Chris Hemsworth, star of May 2011's Thor movie, will virtually be Thor in this spring's Thor: God of Thunder video game. Games publisher Sega said so today and released screenshots to prove it. The movie's Loki, Tom Hilddleston, will also be featured in the game. In both cases, the actors faces and voices will be used in the game. The Thor game is a continuation of Sega's line of Marvel games, which has given the world two poorly-reviewed Iron Man adventures and will lead to a Captain America game later this year that appears to emulate some of the better quality's of the well-received Batman: Arkham Asylum. "In the game, Thor battles through the numerous worlds of Norse mythology to save Asgard. Players will wield the iconic Mjölnir, Thor's legendary hammer, to fight enemies of an immense scale while controlling the elemental storm powers of lightning, thunder and wind to vanquish enemies. Thor must overcome monstrous foes lifted from the pages of the comics, including Ulik, Ymir and Surtur, as well as other daunting enemies." Thor's a guy with a hammer who beats up bad guys. No reason that can't make for a good game.